A fascinating recent study by Elizabeth Alter and colleagues explored how arctic ice and whaling have impacted the breeding and evolution of bowhead whales by comparing ancient mitochondrial DNA to samples from modern populations. To retrieve ancient DNA, researchers took samples of whale bone and baleen from a Thule village archeological site on Somerset Island in arctic Canada. The village is thought to have been a winter whaling spot for the Thule (who were the ancestors of modern Inuits) between 1200-1500 AD and contained toys, vessels, and housing materials made from baleen. The researchers compared the mitochondrial DNA (which is passed down by mothers) from the samples to mitochondrial DNA from whales of five modern stocks from different areas: the Hudson Bay-Foxe Basin, the Baffin Bay-Davis Strait, the Beaufort-Chukchi-Bering Seas, the Okhotsk Sea and the Spitsbergen and Barents Sea. Somerset Island, the location of the ancient Thule village, is located in the Baffin Bay-Davis Strait area. The researchers expected to find that the mitochondrial DNA from the Atlantic (Hudson Bay-Foxe Basin, the Baffin Bay-Davis Strait, and Spitsbergen) populations would be very different from the Pacific (Beaufort-Chukchi-Bering Seas, the Okhotsk Sea) populations because heavy ice sheets separate these oceans. However, they found that these populations were actually not so different—suggesting breeding between the groups. Bowhead whales get their name from their large, hard heads that can break through sea ice. These results suggest that they may use this skill more often than was previously thought. The second major finding from the study was the loss of genetic diversity that occurred during the last several centuries. There were many maternal DNA lineages found in the 500-800 year-old DNA samples that were not found in the samples of modern whales living in the same vicinity. What is unknown, however, is what caused some of the lines to die off. Habitat loss from the Little Ice Age that hit the region in the 16th-19th centuries could be to blame. Additionally, bowhead whales were extensively hunted during this period. It is likely that both of these factors played a role in shrinking the population in this area (thus decreasing its genetic diversity).Though the whale's population is making a recovery, those ancient maternal lines are probably gone forever. Bowhead whales are pretty amazing—they can weigh 100 tons and are probably one of the longest-living mammals on Earth (as evidenced by the finding of an 1890s harpoon in a whale caught in 2007). They are also ecologically important. They are the only type of baleen whale that lives solely in and around the arctic. As large predators, they are on top of many arctic food chains. And they are considered a key indicator species for climate change. Scientists have predicted that climate change will cause a dramatic decrease in arctic sea ice which will likely again impact the population size and genetic diversity of these whales. 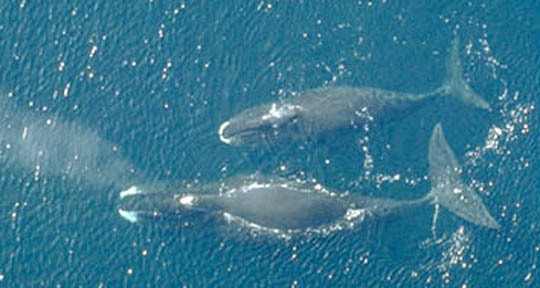 What affects the bowhead whale affects the arctic ecosystem, so it is important that studies like this continue to improve our understanding of the whale's changing population and genetic diversity.